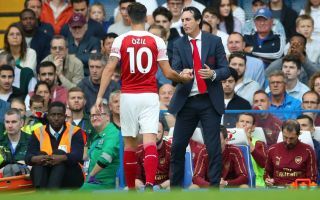 Arsenal manager Unai Emery is claimed to have met with Gunners star Mesut Ozil last season to discuss a transfer to Paris Saint-Germain while he was still in charge there. This report comes from ESPN as rumours circulating about a bust-up between Ozil and Emery are put to bed, with the piece claiming the Spanish tactician is a big fan of the player. Ozil took some time to decide to sign a new contract last season, and was technically free to negotiate with foreign clubs before finally putting pen to paper on a new deal at the Emirates Stadium. Since then, Arsene Wenger has left his position as manager, and Ozil has ended up working under Emery anyway as he replaced the long-serving Frenchman as manager this summer. The report from ESPN states that Ozil missed the West Ham game through illness but that there are no problems between the Germany international and the new manager. Still, he did snub Emery earlier this year, so even though they’re now working together, could there still be a bit of bad blood? Probably not, but Gooners will no doubt want to see their key playmaker back in action soon after missing a number of games through illness in recent times and struggling to hit top form so far this season.